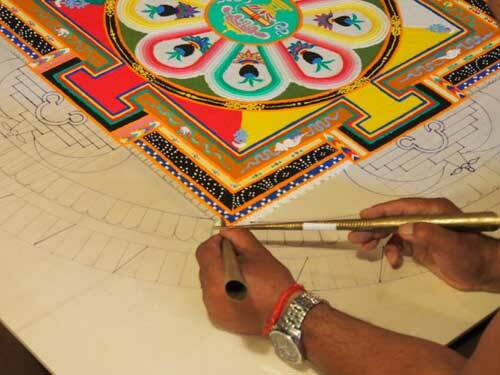 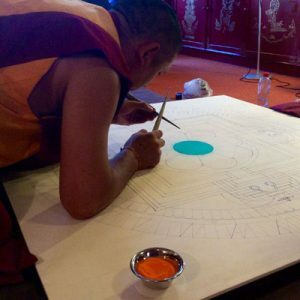 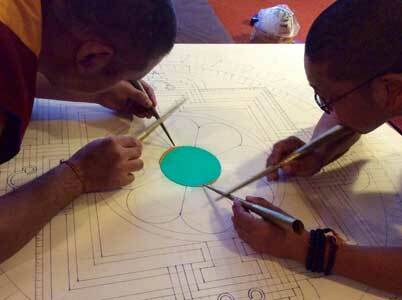 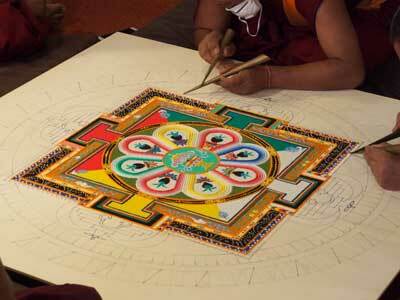 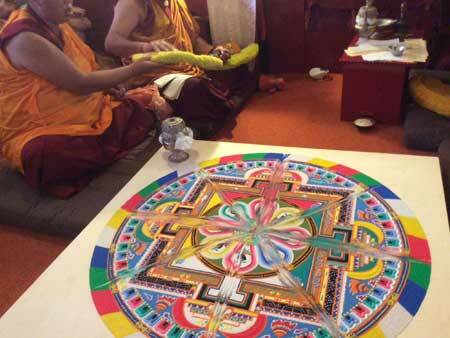 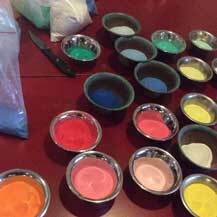 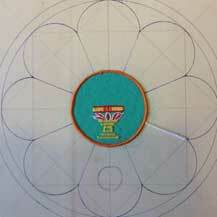 In the following pictures I show you the progress of the making of a the Sand Mandala of the Medicine Buddha, that was created by 4 Tibetan monks from Sera Jey Monastery in our Buddhist Center Maitreya Institute in Amsterdam, The Netherlands (where I teach thangka drawing and painting), in May 2017. 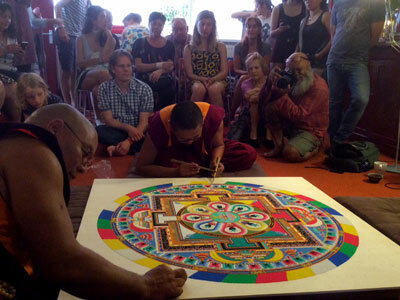 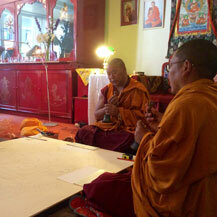 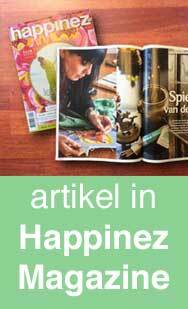 The buddhist monks are currently on a 3 month-tour in Europe for the creation of the tibetan sand mandalas in different buddhist centers and to perform the ancient rituals that are involved in it, as well as selling beautiful Tibetan handicrafts, all to collect donations for their monastery. 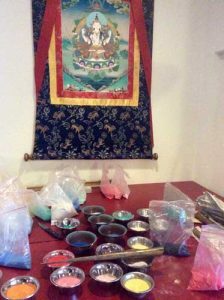 The Sera Jey Monastery is one of the 3 main monastic institutes of the Gelug tradition, founded by Lama Tsong Khapa in Tibet, in the early 15th century. 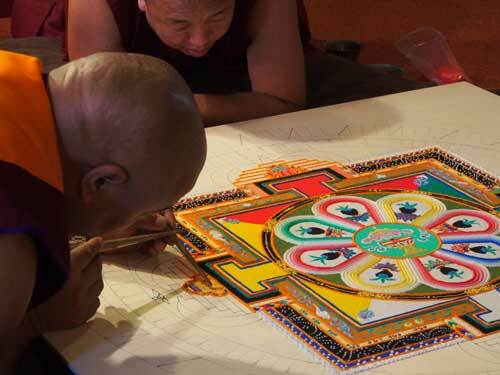 After this buddhist university was totally destroyed and monks were persecuted by communist China when they invaded Tibet in the 1950’s, the Sera Jey Monastery was reestablished in Bylakuppe, South India in 1970. 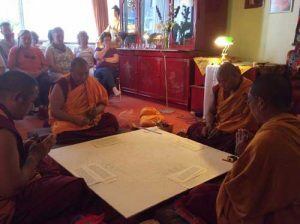 Presently, Sera Jey is recognized as one of the largest monastic institutes & learning centers of traditional Tibetan Mahayana Buddhism. 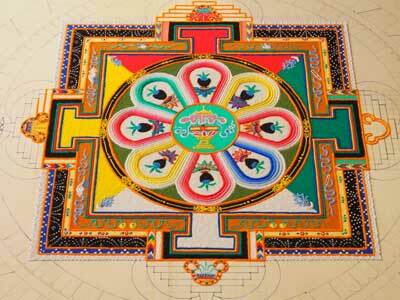 In a number of days -also by means of prayers, mantra recitation etc.- the healing energy of the Medicine Buddha is collected in this mandala. 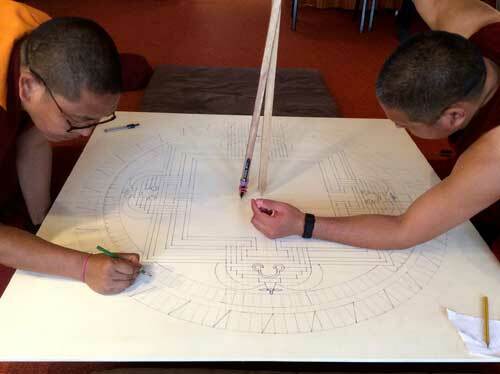 After many days of long and hard work -almost all these monks suffer from back, shoulder and neck pains due to their many hours of sitting in this difficult position- the sand mandala is finally completely finished. 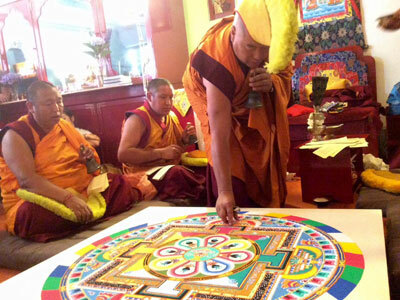 Then, at the end, the final ceremony -again with all kinds of prayers, mantras and bells etc.- takes place, after which the main lama mixes up the sand in a specific way, first in all 4 wind directions, later in 8 directions (so creating a Dharma Wheel with 8 spokes), and after that all the sand is mixed together, where all the bright colors are mixed together, becoming grey. 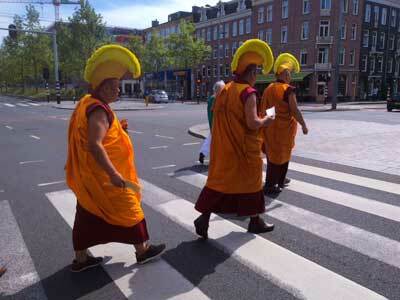 It’s the ultimate sign of detachment. 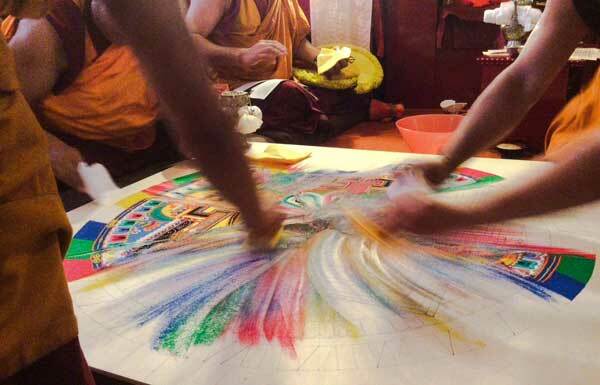 Part of the sand -with its energy and blessings in it- is divided over small bags, and everyone who is present receives one package. 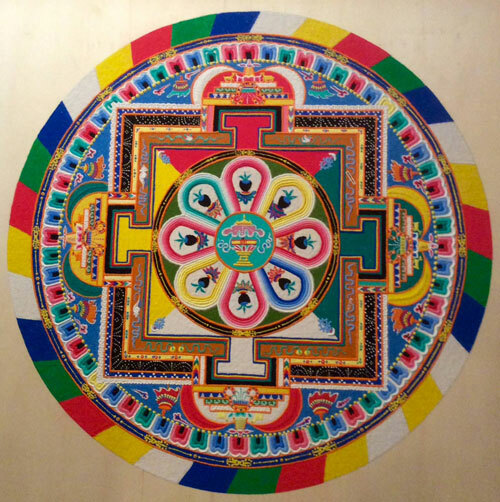 Yo can put it on your altar and /or sprinkle it on the crown (chakra) on the head of a person or animal who is dying (see also the Buddhist animal care page). 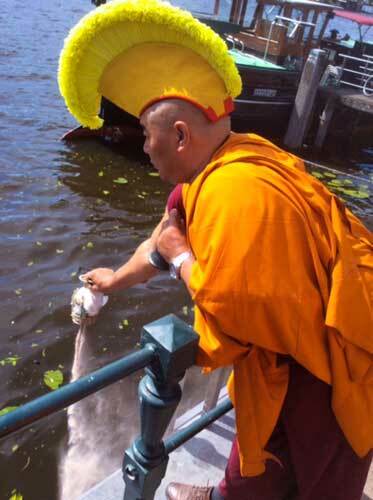 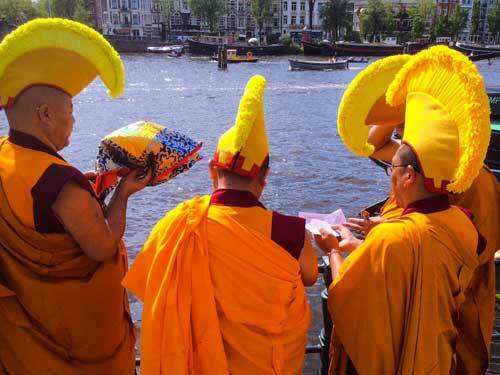 Lastly, the rest of the mandala sand is offered to running water -in this case the Amsterdam Amstel River!- so that it can spread its powerful healing and blessing energies throughout the waters on the Earth.